Northwestern’s 2018 season followed a pattern that has become both infuriating and thrilling under Coach Fitzgerald: underperform early, against non-conference opponents, and kick into Wildcat mode during the Big Ten slate. The ‘Cats adhered to this script dutifully, dropping their non-conference matches, but tearing through the West Division, taking their first football title in nearly two decades. NU’s senior quarterback, Clayton Thorson, began the season by being named to the Johnny Unitas Trophy watch list. With the high expectations, there was also worry—Thorson’s 2017 season ended with a serious injury in the Music City Bowl. In the season opener, at Purdue, Thorson looked to be on track, throwing for 172 yards in a 31 to 27 win. While the victory did not turn many heads in August, by the end of the season it had become evident just how strong Purdue was, and fans realized just how critical NU’s 2018 opener was. Jeremy Larkin led the way for the ‘Cats in that first game, rushing for 143 yards and two touchdowns. The ‘Cats then slid into the non-conference patch and fell into their old pattern, dropping their home debut vs. Duke before losing in spectacular fashion to Akron at Ryan Field. It was Northwestern’s worst loss since at least the 2007 Duke game, and—if one is looking at expectations coming into the game—it might be NU’s worst loss of all time. The team had never before, in its entire history, lost a game in which it was favored by over 20 points (NU was favored over Akron by 21.5). After that debacle, the team seemed to be in freefall. Just days later, Larkin announced that he was retiring from football for medical reasons. NU dropped its sold-out game to Michigan, and it faced #19 Michigan State on the road, sporting a 1-3 record, and without its talented running back. And so began the next phase of the Coach Fitz pattern: Wildcat mode mid-season. Thorson tore into the Spartans for four touchdowns. It was NU’s second road win—the team would go undefeated on the road during the 2018 regular season. The highlight of the game was Thorson’s 77-yard touchdown bomb to Kyric McGowan. NU returned to Ryan Field and took on Nebraska for homecoming. After nursing a shaky lead at halftime, the ‘Cats suffered three ‘Husker touchdowns, interrupted only by a crisp 61-yard TD pass from Thorson to Flynn Nagel. With just over two and a half minutes left in the game, NU was down by ten points. The Wildcats then staged one of the most dramatic and wild finishes to a game in their crazy history, starting with a 31-yard field goal by Wildcat kicker Drew Luckenbaugh. The climax was a drive for the ages: two and a half feet from their own end zone, the ‘Cats built a 99-yard masterwork that included a 32-yard pass to Flynn, a 27-yard pass to Bennett Skowronek, and a 5-yard scoring pass to Jefferson. In overtime, J.R. Pace picked off the ‘Huskers in the endzone, Pace’s second interception of the day. Luckenbaugh made a 37-yard field goal to end NU’s overtime session and take the game. If Akron showcased the very worst that Northwestern can produce, the team’s never-say-die performance at the end of the Nebraska game displayed the team’s very best: a thrilling, relentless group that played to win. After a tepid victory over hapless Rutgers on the road, the ‘Cats came back to Evanston and faced #20 Wisconsin, the division favorite, in a game that showcased NU’s opportunistic defense and Thorson’s rushing ability. The NU defense, led by Paddy Fisher, Blake Gallagher, Trae Williams, and Montre Hartage, forced three fumbles and kept the Badgers to just 4-14 on third and fourth down tries. Northwestern’s breakout star, first-year running back Isaiah Bowser, racked up 117 yards and a touchdown as the ‘Cats pulled off their fourth straight Big Ten win to secure their lead in the West Division. The team dropped their third nonconference game in the long-hyped midseason faceoff against Notre Dame, the first trip by the Irish to Evanston since 1976. The game was NU’s fourth sold out home game during the season, tying the program’s record set during the Rose Bowl season in 1948. For possibly the first time ever, NU did not even offer individual tickets to the game: they had already been snatched up by season ticket holders. 2018’s four sold out games brought NU’s average attendance for the year to nearly 44,000, the highest since the mid-1960s. After handling Minneapolis and Illinois, the ‘Cats stood undefeated in the West and took on #6 Ohio State in Indianapolis for the conference title. A valiant effort by the team fell short, and Northwestern prepared for the Holiday Bowl rather than Pasadena. The ‘Cats were again underdogs, facing #17 Utah in San Diego. NU looked the part in the first half, trailing the Utes 20 to 3 by the break. However, Northwestern returned from the locker room and delivered one of the most powerful single quarters of football in decades, stunning Utah 28 to 0 in the third. In the span of nine minutes, NU took advantage of three Utah turnovers and enjoyed a short TD pass, Jared McGee’s 82-yard fumble recovery touchdown run, an insane TD pass from Thorson to Trey Klock, and a touchdown run by Lees. 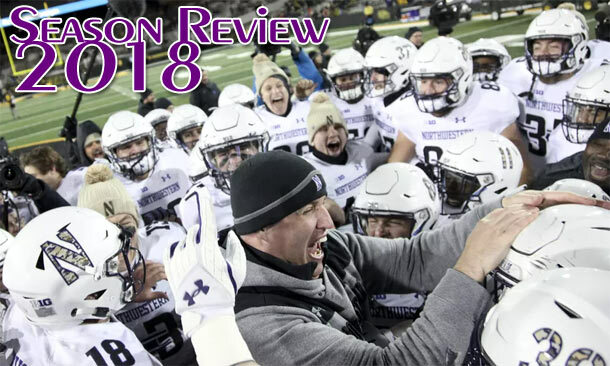 The win by Northwestern, its third straight bowl victory, propelled the team back into the AP rankings at #21 and set the team up for a strong preseason in 2019. What follows are excerpts from a couple of my posts to this site during the course of the 2018 season. Please note that the comments posted below are only ones written by me, and this year I did not provide game previews or postgame commentary. Most of the articles on HailToPurple.com in 2018 came from other contributors. Northwestern has welcomed a new class of 18 scholarship recruits as part of signing day 2018, a class that includes 16 new 'Cats who signed their letters of intent back in December and two students who signed today. This year the class leans to the offense, with 10 students on offense (plus 2 walk-ons, both on offense) and 8 on defense, balancing last year's defense-heavy recruiting class. The 'Cats followed up last year's relatively light state representation by going heavy in the home state, recruiting seven players from Illinois, including one from Chicago itself. The recruiting analyst crowd thinned a bit this year: Scout.com has now folded into the CBS-247 group and no longer does independent recruiting analysis or rankings. Both of the remaining recruiting sites, Rivals and 247, rank NU's 2018 class 14th in the Big Ten and 59th in the nation, one of the lowest rankings for the Wildcats in the last two decades. This is despite the fact that CBS-247 gives every NU recruit at least three stars. If misery loves company, note that Stanford-- one of NU's key recruiting rivals-- ranked 70th nationally this year. The following table shows the list of recruits who have committed to Northwestern. The comments are compiled from material taken from Rivals.com and CBS's 247Sports. For more detailed info and analysis, be sure to check out Lou V.'s reporting at Rivals and the work at CBS's 247 Sports. CBS 3-Star. Illinois, Nevada, and NM St. offered. Rivals and CBS 3-Star. 14 offers, incl. Boston Col., Duke, Indy, Minny, Mizzou, Vandy, and 'Cuse. Rivals and CBS 3-Star. 10 offers, incl. Cincy, Harvard, Navy, and Yale. Rivals and CBS 3-Star. 10 offers, incl. Columbia, Neb., Penn. Rivals and CBS 3-Star. 6 offers, incl. K. St., Rice. Rivals and CBS 3-Star. New Mexico, Rice offered. Rivals and CBS 3-Star. 14 offers, incl. Duke, Indy, M'Land, Minny, Miss., NC St., TN, Wake, Wisky, and Yale. Rivals and CBS 3-Star. 10 offers, incl. Columbia, Cornell, Dartmouth, Duke, Princeton. Rivals and CBS 3-Star. 9 offers, incl. Ark., Duke, NC, Purdue, R'gers, TN, VA Tech. Rivals and CBS 3-Star. Indy, Miss., NIU offered. Rivals and CBS 3-Star. 10 offers, incl. Air Force, Harvard, Indy, Neb., Rice. Rivals and CBS 3-Star. 8 offers, incl. Miss., Navy, Vandy. Rivals and CBS 3-Star. 23 offers, incl. Ark., Boston Col., Cornell, Harvard, Illinois, Iowa, Minny, Princeton, Purdue, R'gers, 'Cuse, Vandy, VA Tech, Yale. Rivals and CBS 4-Star. 14 offers, incl. Illinois, Indy, Iowa, Minny, Neb. Notre Dame, PSU, Princeton, R'gers, Wisky. Rivals and CBS 3-Star. 21 offers, incl. L'ville, UMass, Miss., Navy, R'gers, 'Cuse, Yale. Rivals and CBS 3-Star. 7 offers, incl. 'Cuse, Vandy. CBS 3-Star. 14 offers, incl. App. St. and Tulane. Rivals and CBS 3-Star. 6 offers, incl. Indy. Summer is nearing its end, and the annual college football magazines have appeared at the newsstands, offering their picks and predictions. The slate of previews typically begins with Athlon and Lindy's and concludes with the Big Ten's August media event, when the conference announces its official front runner. Last year the media turned in their third highest preseason predictions for NU since 2000, but they still fell well short of the 'Cats' #17 national finish. Since 2000 the media have underestimated NU twice as many times as they have overestimated NU's season performance. Compare this to the constant overestimation of teams such as Notre Dame or Michigan. During every summer since 2000, HailToPurple.com has posted a recap page of what the larger 'Net and print publications predict for NU. Here are the 2018 Wildcat predictions. Let's begin with CollegeFootballNews.com. The staff at CFN predict a 41st place finish for NU, citing the Wildcats' defensive line and coaching as strengths and the secondary and skill players as concerns. As with every single other media source, CFN pins the Wildcats' fate on the health of quarterback Clayton Thorson: if Thorson is nearly 100% this season, NU will do fine; if he is not, then the team will struggle. CFN seems to think that NU will do just fine, predicting a third-position finish for NU in the B1G West, behind Wisconsin and Iowa. CFN predicts that NU will land in the TaxSlayer Gator Bowl, facing Florida. Moving on to the print picks, Athlon takes a lower view of NU's potential, expecting that Thorson won't be quite at 100% and the offensive line might struggle. Athlon slots NU at 46th nationally and fourth in the B1G West (behind Wisconsin, Iowa, and Purdue). Athlon predicts that the 'Cats will coast to a 6-6 finish, 4-5 in the conference, good enough for a trip to San Francisco to take on Oregon. The second major national preview magazine is Lindy's, which has a nearly identical take as Athlon this year, also placing NU third in the West, behind the Badgers and Hawkeyes. Lindy's ranks NU 40th in the country, two spots above Purdue. In his preseason mag Phil Steele is aligned with most of the other print sources, also putting NU third in the West. As with CollegeFootballNews.com, Steele predicts that the 'Cats will land in the Gator to play the Gators. Wrapping up the print pieces, Street & Smith's predicts that NU finish a disappointing fifth in the West, behind Wisconsin, Iowa, Purdue, and Nebraska. S&S also notes the importance that Thorson's recovery holds for the team, and predicts that NU will finish with just enough wins to earn a trip to the Quick Lane Bowl. Internet statistician and ranking mogul James Howell has been offering his rankings and game predictions for many years. For the 2018 pre-season his power rankings slot NU at a strong 24th, good for another third-place pick in the B1G West. Internet source The Power Rank builds a predictive model for all Div. I teams. For 2018, The Power Rank ranks NU 32nd, exactly where it ranked the 'Cats before last season. 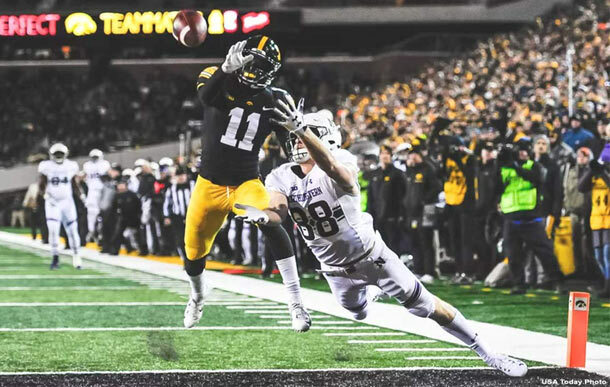 The Power Rank is still high on Iowa, placing the Hawkeyes (and, of course, the Badgers) above NU, slotting NU third in the West and sixth in the B1G overall-- just like last season. The Sports Formulator, another model-based Internet source, sheds the optimism it had for NU last year and ranks the 'Cats 56th nationally, the lowest prediction for NU this year, and the only one that comes close to the old "Heinz Line." Sports Formulator tabs NU for fourth in the West, just behind Purdue and above Minnesota and (66th-ranked!) Nebraska. The site does predict a West Coast bowl for NU, a trip to San Francisco to play Utah. Another Internet prognosticator is Mike DeSimone, who has NU in 37th nationally and second in the West, ahead of Iowa. Among newspapers, the Orlando Sentinel is one that provides a detailed preseason rank of all teams. The Sentinel is one of the few media sources that puts NU in its top 25, ranking the Wildcats 19th. Orlando Sentinel writer Matt Murschel cites Thorson's potential, along with strong possible performances by backup QB T.J. Green, defensive end Joe Gaziano, and linebacker Paddy Fisher. Bill Connelly posts on SB Nation, and his preseason B1G power rankings placed NU at 38th nationally, the same as last year. Connelly's preview is packed with detail, and he is cautiously optimistic about NU's chances, noting that the team will need to avoid its typical slow start in September if it is to contend for something beyond a bowl game this year..
CBS Sports released its national preseason ranking on August 19, and the Tiffany network placed NU at 42nd, third in the West. Jerry Palm predicts that NU will play in the San Fran Bowl vs. Utah. USA Today's Paul Myerberg offered his Big Ten power rankings during the summer, and he put the 'Cats in sixth place, good for second in the West, just ahead of Iowa. "...the Wildcats [are] Wisconsin's biggest threat in the West." Myerberg also pins this potential success to Thorson's recovery. Bill Bender at TheSportingNews.com is not high on the Wildcats' chances in 2018, placing NU fifth in the West, behind Nebraska and Purdue. Despite the low ranking, Bender oddly provides one of the highest bowl predictions for NU, projecting the 'Cats in the Holiday Bowl to play USC. The major polls have been released for the preseason, and NU is unranked. The 'Cats pulled in 67 votes in the Coaches Poll. Ed. note: At the end of every year, we go back to the preseason media predictions and call out the most and least accurate. After two years of relative accuracy, the media regressed in 2018 and seriously underestimated NU's performance. The best prediction, by far, came from the Orlando Sentinel, which nailed NU's #19 ranking. There were several candidates for the "dog" pick in 2018. The biggest loser was Street & Smith's, with its fifth-place West finish and bowl showing in Detroit. HailToPurple has tried to maintain as accurate and complete a history of NU's football home sites as possible. Part of our research is the team's home attendance through the years. Until recently, our attendance research went back to 1920, covering a few years during the Northwestern Field period, and the entire Dyche Stadium / Ryan Field period. We've now expanded our attendance research to cover the entire time that NU has played its home games on Central Street, beginning with the opening of Northwestern Field in 1905. This is as far back as we can accurately go: it would be impossible to get good information about attendance when NU played on Sheppard Field or, before that, Campus Meadow. You can find the expanded annual info here: NU's average annual attendance. And NU's list of sold-out games, also now includes all sold-out home games since the team moved its field to Central Street.